Minnesota Leafless Gutters are known for their professional installation of Seamless gutters, and with good reason. They are excellent at what they do, and their customers can count on their seamless gutters being installed correctly and preventing the many problems associated with mediocre gutters. But excellent gutter installation is not the only service provided by Minnesota Leafless Gutters. As you well know, the St. Paul Minnesota area gets a lot of snowfall most years. You can have the best gutters in the world, but if enough snow accumulates on your home’s roof, you could still find yourself with major problems. The staff of Minnesota Leafless Gutters is ready to help you by providing another important service, roof snow removal. 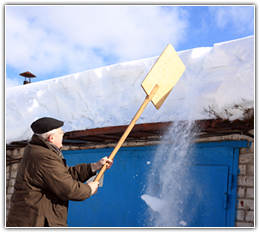 You might have attempted to get the snow off your own roof before, but the chances are good that you did not have the correct equipment to do the job well, or to do the job without risking injury. Minnesota Leafless Gutters has the best equipment, tools, and experience to remove the snow that has accumulated on your roof before it causes problems. Rather than risk your own safety or spend your precious time trying to do this job, leave it to the professionals of Minnesota Leafless Gutters. Even the light, fluffy kind of snow we sometimes get is heavy. With temperature fluctuations, the light, fluffy kind of snow will compress and become denser, and when the temperature goes up a few degrees, melting will cause the snow to liquefy more. And when water is present, the weight increases. The added weight to your roof can cause serious structural damage. Your seamless gutters will do a lot to prevent leaks, but no gutter can prevent all leaks. When a house has an enormous amount of added weight on its roof, the cubic-feet of snow will begin to melt, and the water will need to go somewhere. Often, it finds its way into your house. Cave-ins are almost always associated with the added weight on a house’s roof. If you have neglected the accumulating snow on your roof for long enough, the weight can cause the structure to fail. Ice dams form when snow/ice accumulation is large enough and has nowhere to go. Your gutters may be doing excellent work, but the accumulation of snow and ice can overwhelm them. Ice dams can weigh thousands of pounds. This type of damage can be prevented. Contact Minnesota Seamless Gutters this winter to help clear off the snow from your roof so that you can rest easy knowing that you will make it through another winter without damage to your home. Call 612-221-0362 to speak with a member of our snow removal team.